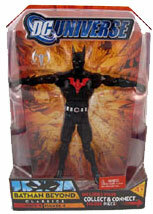 Description Of Item: Mattel produced this line of action figures based on the greatest heroes and villains from the DC Comics universe! Each figure is about 6 inch in height and features multiple points of articulation. As a bonus, each figure contains a builder piece that allows you to assemble Despero when all the pieces are collected! Collect them all, each sold separately.